A new Overwatch developer update has been released, focusing on popular community topics. As ever, game director Jeff Kaplan fronts the video, which looks at in-game toxicity and hero balancing, with particular focus on Mercy, Junkrat, Mei, Hanzo, and Symmetra. Kaplan says that since changes to Overwatch’s report function, which brought reports to console, warned players ahead of bans, and introduced report feedback, incidents of abusive chat are down 17%. There’s also been a rise in the number of reports, with players reporting 20% more since the changes came in. Kaplan also mentioned a more proactive approach to player behaviour that the team have undertaken – Blizzard now actively seek out toxic players through their social media (Twitch, YouTube, etc) accounts. That means they’re often able to take action against toxic players before they’ve even been reported. Regarding hero changes, Kaplan discussed several points. 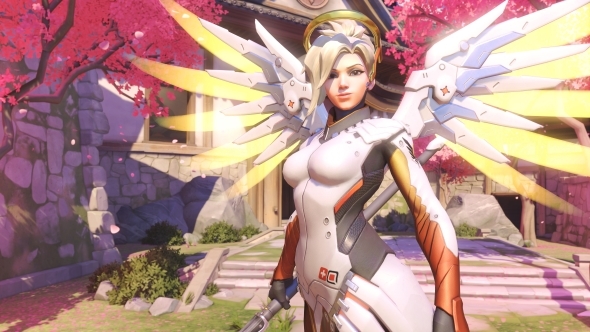 Some of the most notable of those are to Mercy, which are currently being tested on the PTR. In a pretty impassioned address to Mercy mains, Kaplan says that if the changes nerf her too strongly, “we will bring her back,” and that the team will be paying “very close attention” to her changes. Other updates focused on the possibility of changes to Hanzo’s Scatter Arrow, but the team aren’t sure whether they’ll tweak the ability or replace it with a whole new one instead. The message behind upcoming changes to Mei and Symmetra is that Blizzard don’t think either hero is in a particularly bad spot, but will help both of them out if needed. Finally, over on the Overwatch forums, he mentioned upcoming changes to Sombra and Doomfist.